New to VIntage Woods is out interior Thin Wood. This wood is only 3/8" thick making easier to install and easier to handle. The boards come in 4' lengths and are a mix of medium to dark Vintage Gray. Sold in boxes that cover 25 SF for $225 with shipping included! This makes our product $9 per SF, while competitors are charging over $12 per SF and that doesn't include shipping! Check out our products page for more info on this awesome new product, and keep your eyes peeled for the next exciting news! The structure of a building is what makes it function. Vintage Woods and Metals creates custom finished building materials to make the structure a focal point. Vintage Woods, Inc.. Change is good! 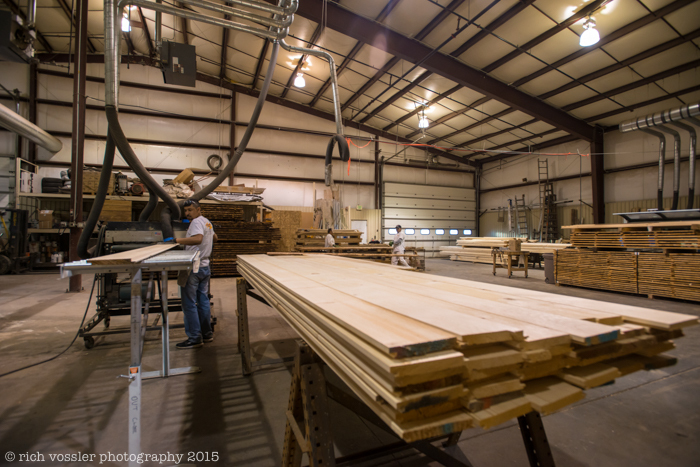 Excitement is the word at Vintage Woods Inc., most notably is a new facility in Gypsum, Colorado. This new facility will provide a greatly expanded shop featuring new equipment, a huge yard and a beautifully appointed showroom where clients can see large samples of our offerings and meet with our sales consultants. We are pleased to say that the benefits of these changes have been evident, not only to our team, but more importantly our to our clients and customers. This new facility will provide more space! More space to accommodate more equipment and provide opportunity to work on bigger pieces. In fact we recently had some huge 12"x24"x60' timbers come through that we were able to custom finish. Also new and possibly most exciting is the addition of a new Kentwood M609 molder. An in-house molder brings a very important and time consuming step back under our control ensuring improvements in scheduling and quality control. Finally, we have a showroom! A place where many of our products have been displayed in very large proportions, giving a true sense of how beautiful and striking our products are once installed. Seeing is believing. The showroom will also be a place for architects, designers and builders can bring their clients to meet with our consultants and find the perfect additions to their projects. This new yard improves our storage, organization and staging processes. This well appointed shop greatly increases our capabilities. Big samples help with big ideas. Come in and plan your next project with us.